In addition to celebrating milestones and achievements, anniversaries are most importantly times to stop and reflect on one's purpose for being. Given that this is Saint David's 60th year, the school has a unique opportunity to do just that. In an effort to not only celebrate this milestone in the school's history, we have made it a priority to give back--to contribute to the greater good in a meaningful and substantial way. Saint David's wanted its focus to be on "helping children" and "education." What better way to celebrate the mission of our school than to reach out and help build another. Sixty years ago this February, a small group of determined families and educators, against incredible odds, founded Saint David's School. In this anniversary year, we have committed to do the same. Under the direction of the Student Council, the Class of 2011 has chosen to lead this effort and build a school in Ethiopia. This past Tuesday, January 25th, Student Council President, Colin J. and I presented this initiative to the boys in Chapel. We spoke not only of the school's anniversary and its significance, but also of the school's mission, and of the boys' collective responsibility to contribute to the greater good. We also spoke in chapel about the notion of delayed gratification and how in our "New York" lives we do not often want for much, or for long. The 400 children who live in the Tigray area of Ethiopia, where Saint David's will work, is in desperate need of a school. They have none. And a well. They do not have one of those either. Their needs are great. Building a school in Mamet village, Ethiopia is not something that the boys will achieve in one year. It may instead take several years. Like the great cathedrals of Europe, what the class of 2011 begins today may not be completed for many years to come. Today's 4th grade boys, or maybe today's 5th grade boys will be the ones who ultimately orchestrate its completion in 2014 or 2015. The Class of 2011 is beginning something, a legacy, far greater than themselves. After chapel, the boys went to Hume Library to meet Saint David's important partners in this endeavor: Mimi O'Hagan from Mimi's Building Blocks and Anne Marie Fox from Save the Children. A slide show giving an overview of the program is embedded. Click slide show to enlarge. 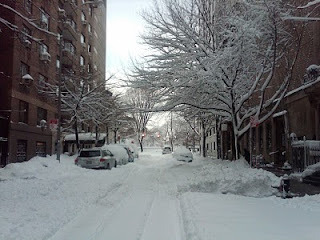 This is what 15 inches looks like on 89th Street early in the morning. Happy Snow Day. Saint David's Winter Festival of Art and Music is well under way. Given our school-wide theme this year, The Aesthetic, the festival takes on an extra special meaning. 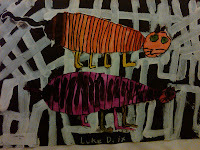 In addition to many musical and performance events, the festival also celebrates boys creativity in the visual arts. Hung throughout and around the school, boys work is on display. Walking though the school today I snapped a couple of pictures with my cell phone. One of the five component skills of drawing is the perceiving and rendering of the (negative) spaces in between and around objects. 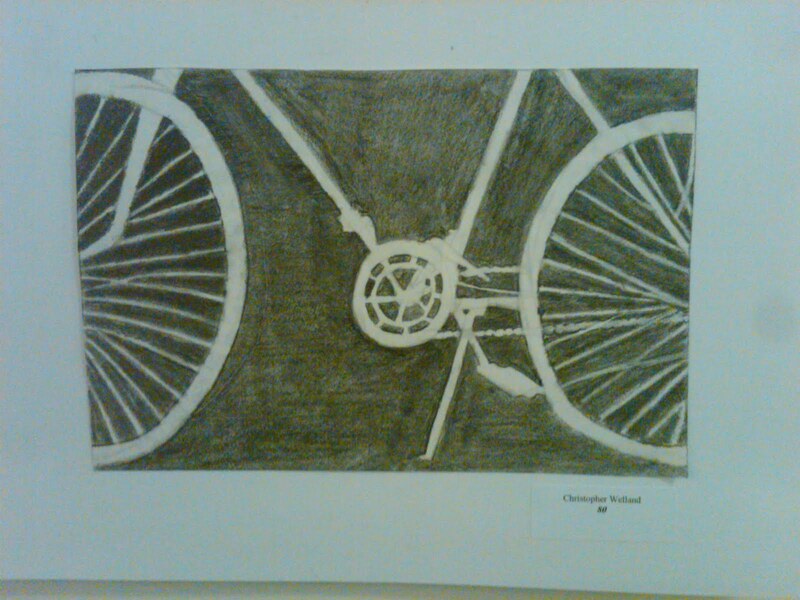 This first piece by Christopher W., 8th Grade, explores this component in bicycles. 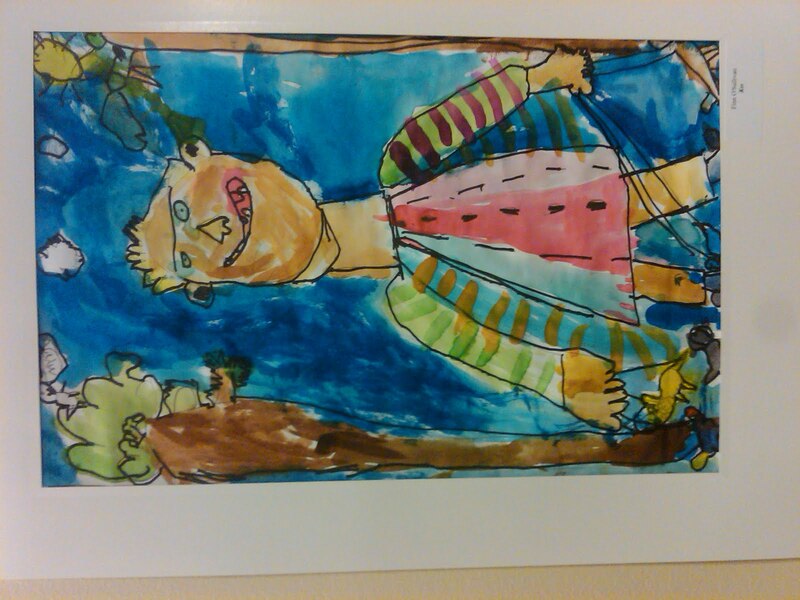 After examining reproductions of tribal art of Ghana and Australia aboriginals, first grade boys worked with ink, watercolor, and tempera to create their own works with patterned backgrounds. 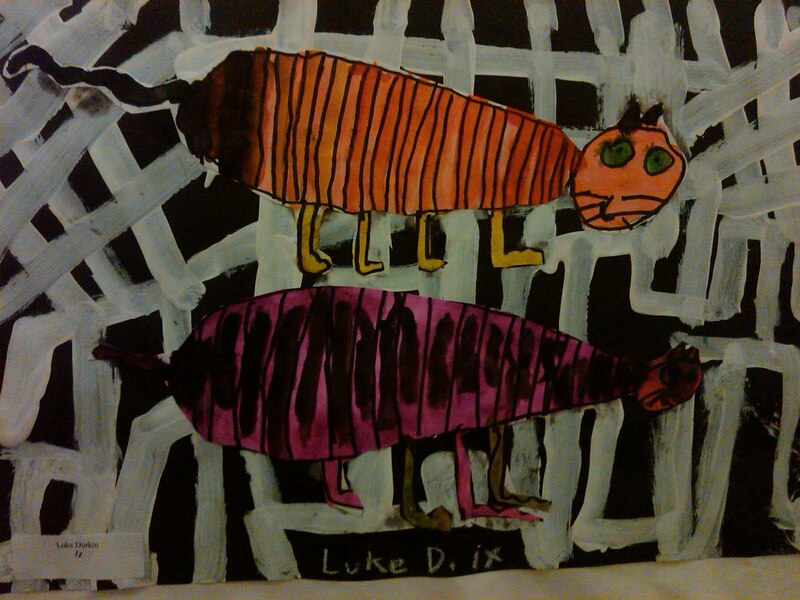 Here Luke D., inspired by his two cats, has created a patterned background of white interlocking lines with the colorful creatures highlighted in the center. 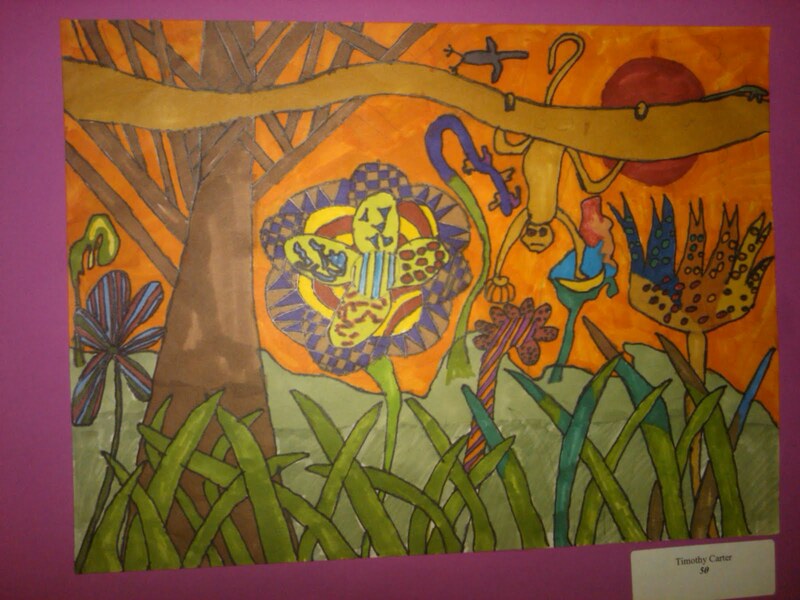 Above is an example of the fifth grade's exploration of jungle landscape drawings with imaginary animals' outline traced with a black line. Tim C.'s use of color and overlapping shapes gives his piece a real sense of depth. Like us, shoes we are told, can have individual personalities which are revealed in shape, form, light and dark. 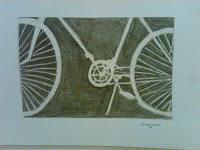 Inspired by paintings by Van Gogh, eighth grade boys observed carefully contour and value to produce these drawings. 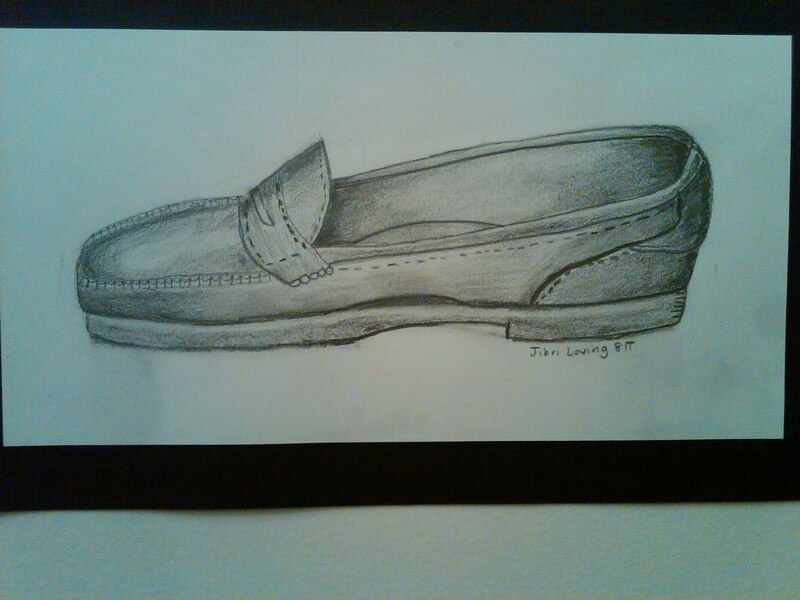 Here Jibri L. illustrates his shoe revealing a little of his personality. 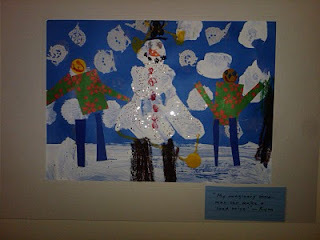 In preparation for their "snowman" using mixed media, prekindergarten boys viewed and discussed Anna Mary Moses' winter scenes that featured people working or playing in snowy landscapes. 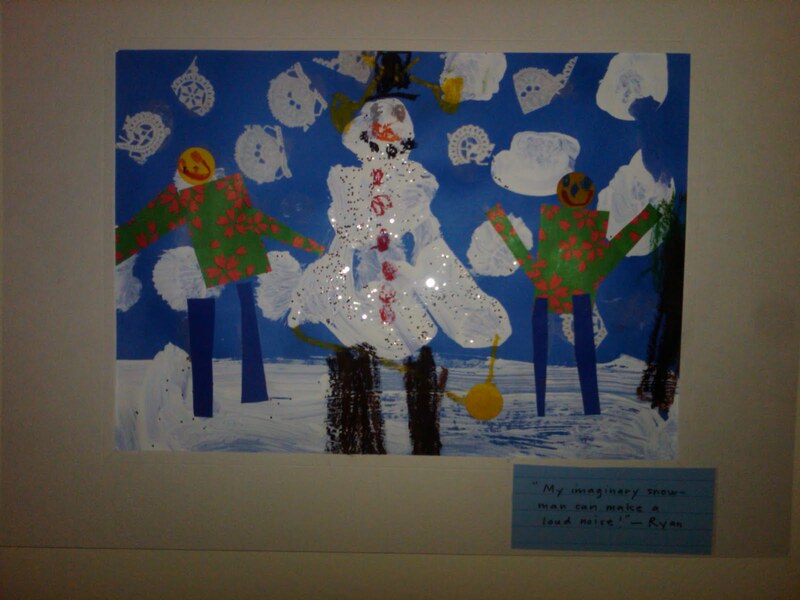 Here Ryan depicts "My imaginary snowman can make loud noises." And loud it is! Based on Gothic Rose Windows and Mandala designs from many different cultures, third grade boys learned to mix color and draw with black tempera paint. 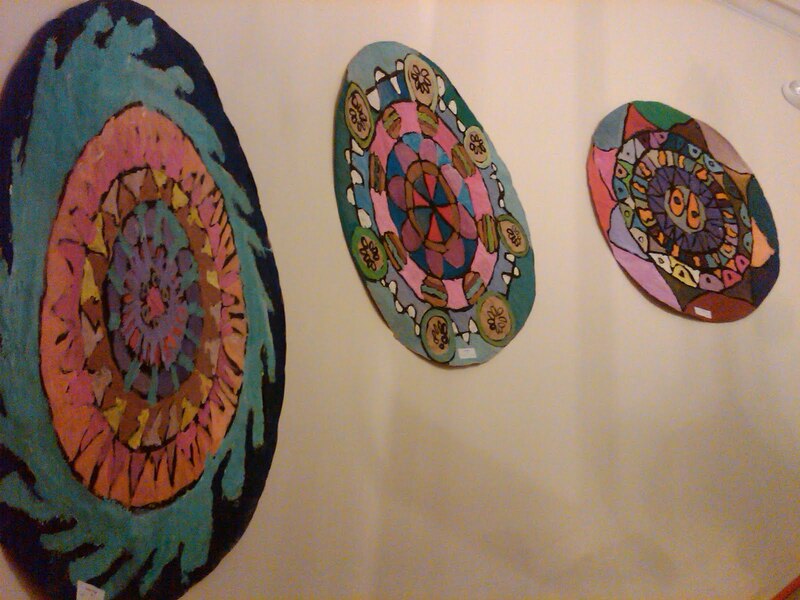 These are giant works that measure some 3-4 feet in diameter. They cover the walls on both sides of the Building 14 spiral stairwell as it winds its way up through the school -- spectacular! 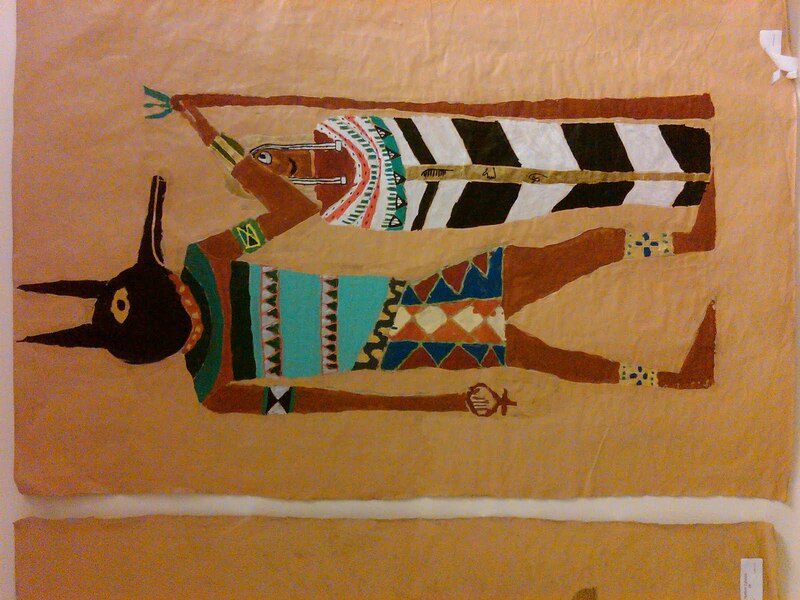 After studying the style and proportions of ancient Egyptian figures in wall paintings, fourth grade boys chose an actual, or created their own deity to portray in their "wall painting." 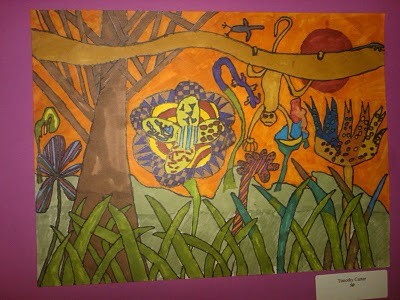 Their work, like many of the pieces on display throughout the festival, are tied directly to other subject area curriculum. 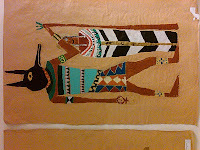 In this case, the boys' "wall paintings" are connected with their study of ancient civilizations in history and literature. These works are life size (boy size) consuming large surface areas on the walls leading into Hyman Hall--well worth the visit. And finally, I came across the Omega Friendship Portraits on the first floor. Each Omega boy chose a partner to draw in an imaginary environment. Using water color and fine tipped black outline markers, the boys illustrated each other. In this final piece, Finn O'S. portrays his partner ... happily somewhere! The Festival is well worth your time. Come by and see these and many, many more examples of stunning art and a true representation of the aesthetic at work at Saint David's. 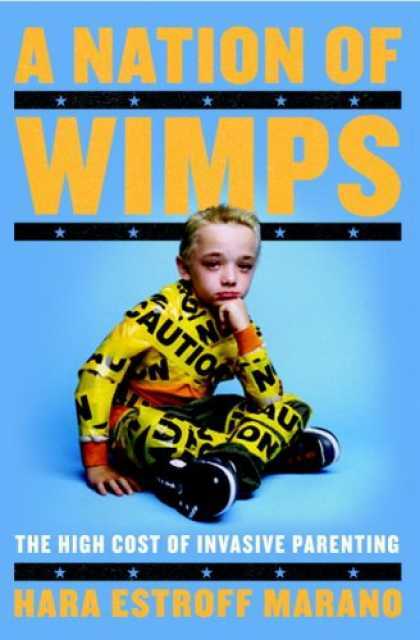 Speaking to Saint David's parents on Thursday night, January 20, 2011, Hara Marano, author of A Nation of Wimps asked those present a central parenting question: "All parents want their kids to do well in school. But is that all you want? Success in life has a lot to do with curiosity, empathy, and confidence. Just because kids register competence on SATS doesn't mean they feel competent. Just how much of a whole person are you willing to sacrifice to engineer academic success?" Coming on the heels of Amy Chua's controversial piece Why Chinese Mothers are Superior in the Wall Street Journal January 8th, Ms. Marano's visit could not have been better timed. Her interest in issues associated with American parenting began some years ago when she was asked to work on a story for Psychology Today examining why so many college students were experiencing emotional fragility on college campuses. Her findings concluded that current American parenting practices were in need of dramatic change--that the invasive parenting practices of the last few decades have come at a high price--psychological fragility. After outlining her reasons for why current parenting practices lead to psychological fragility, Ms. Marano presented four suggestions for better parenting. Firstly, she suggested parents let children play. Let them engage in free play, both vigorous silliness and fantasy play. This play should not be directly monitored by adults, and preferably outdoors. Children need totally unstructured time for exploration and play that they create by themselves. No schedule. No agenda. No adult coaches. Secondly, that families eat dinner together at least five nights a week. All around the same table. All eating the same meal with at least one parent present. Accompanied by conversation in which every family member gets to participate. Thirdly, learn to criticize your children the right way--constructive, specific criticism--too much leads to perfectionists; too little and they grow up not being able to cope with any criticism. This is the key factor, she feels, by which your child will assess his or her relationship with you. Finally, Marano suggests that as an important corollary, parents must learn how to praise their children—and what for. Praise only when there is something worthy of praise. And when there is, focus on the effort—not on how talented or brilliant your child is. Spirited debate ensued as the evening concluded with a question and answer session. The boys have been purposefully moving about the building happy to be back at school. I know that may sound a little strange; but they really do look happy. Teachers too, are right back at work, preparing lessons, imparting knowledge and wisdom, helping our sons find their voice, their strengths, their passions. Monday last, while the boys were enjoying the last day of their vacation, our faculty were participating in a full day of professional development activities. 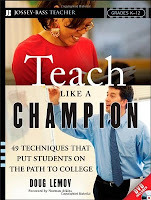 Joining us for the day was Doug Lemov, author of the book Teach Like A Champion, and director of Uncommon Schools. Doug conducted an engaging workshop with the faculty on three specific strategies common to great teaching. 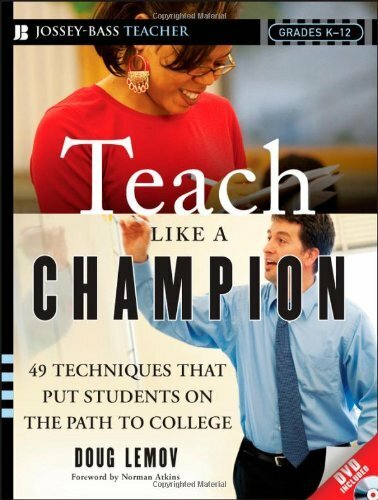 His research has identified several significant attributes of great teaching and great teachers. We focused on three most relevant to us here at Saint David's. Having addressed the What, When and Why questions over the last several years, our school-wide curriculum focus this year is on the "How" questions: How do we know our boys understand what we are teaching? How do we know our teaching is effective? and How do we teach (what methods do we use)? Specifically, the Monday work with Mr. Lemov addressed the methods "How" question. The second part of Monday's professional day focused on curriculum design work associated with Teaching for Understanding, a framework we are using to critique and refine units of study school-wide. Having examined and learned the framework last year with the help of one of Project Zeros professors, all teachers this year are working on refining one unit that they teach using the framework and implementing it this spring. Thoughtful, critical curriculum planning and effective, dynamic teaching practice when perfectly married, constitute the essence of great schools. We are constantly working on both.